In the age of TV’s, mobile phones and games consoles; it can be easy to let your children keep themselves busy with their devices, take a look at a few ways to get them off the screens and into the great outdoors. Enjoy outdoor sports such as croquet, bowls or badminton that adults and children alike can easily get involved in. Take your children for a walk along a canal or river, or go on a fishing trip. There are hundreds of walking routes up and down the UK, take a long walk and find the best trees to climb. 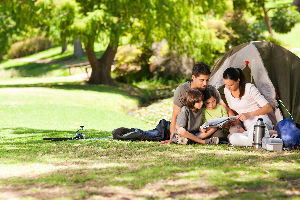 Cook your dinner over an open stove or campfire if permitted by the site; enjoy marshmallows on skewers for desserts. If you’re feeling adventurous, take your children with you on a bushcraft course, learn to tie knots, properly start and maintain a fire and get involved with nature. When they are all tired out, take turns round a campfire telling (not too scary!) ghost stories. Take a walk along the pier or boardwalk; be sure to visit one of the seaside arcades. Treat your children to ice cream or fish and chips (watch out for seagulls!). Take a stroll across the sand and look out for shells or crabs and barnacles in the rock pools. Get competitive with a sandcastle building competition, or if you’re feeling adventurous – host a treasure hunt. Get involved in some beach activities, fly a kite, play a game of volleyball or brave the waves for some bodyboarding and surfing. Make a sundial, all you need is a compass and a stick to show them how people used to tell the time before clocks and watches were invented. Get involved in gardening, allocate a patch in the garden and plant some seeds, watch them grow over the summer. Use your outdoor furniture to create an easy obstacle course for your children and their friends, if you’re feeling competitive, host a paper aeroplane competition. Put on some old clothes and have a water fight, if you don’t want to ‘splash’ out on water guns, pick up a pack of cheap balloons and have a water balloon fight. Unfortunately, as we all know the weather in the UK can be very unpredictable, we’ve compiled a list of activities to keep your children happy, even if the weather isn’t. Have a film marathon, get comfy on the sofa with some classics from Disney or introduce them to your childhood favourites, re-enact their favourite scenes together afterwards. Release your inner child and convert your front room into a fortress or den. Get busy in the kitchen, bake a cake with your children and let them get creative with the decorating. If you’re feeling brave, let them cook dinner. Play a board game, teach your children to play chess or other classic board games. Let their imaginations run wild, write a story together and read it out to the family. Making exploration of the great outdoors and keeping traditional activities alive is a vital part of a child’s development and is a positive reinforcement to help every child to grow in confidence and ability. If as a parent you can organise varied activities for your children so that they are not glued to a screen all summer, they will not only benefit from the physical exercise and fresh air but they gain life and social experiences that are invaluable. At school, our teachers work hard to teach in a variety of ways ensure your child is engaged, although there may not be the provision at all schools to arrange camping trips and the other ideas above, they use the space available to the best advantage. Here at Building Additions, we have helped many schools with creating flexible space with our fabric partitions and moveable walls. Many schools use these to enable them to use their space more flexibly. There are a wide range of bespoke finishes available and engaging graphics such as maps can be applied. Give the team at Building Additions a call for more information regarding all movable walls and folding partitions on 01373 45457.